This template is suitable for businesses that operate an affiliate scheme "in-house", that where the programme is run by the business and not a third party affiliate network scheme. If you use self managed software, this template is likely to be suitable. 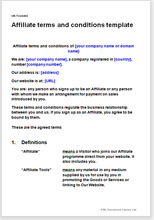 The template can be used as a contract for a wide range of affiliate programmes.